In my opinion, one of the marks of a great book is the ability to evoke a strong range of emotion in the reader. There have been novels that when I finish reading them I feel as if I’ve been riding a rollercoaster of emotion. In all my years of reading, I’ve never experienced the sort of emotional journey that Margaret Atwood facilitates in The Handmaid’s Tale. The Handmaid’s Tale is a fictional story about Offred, a Handmaid in the Republic of Gilead; a world where people are defined in name by their function to society. Women aren’t allowed to read, write, or work outside of service to the social order. Women are Martha’s (servants), Wives, or Handmaids (reproducers) the men are Commanders (leaders), Guardians (police), or The Eyes (secret police) along with doctors, shopkeeps, etc. The society is based around bible-derived ceremonies, symbols, and beliefs. Before the formation of this patriarchal, fundamental Christian society Offred (you never learn her real name) lived happily with her husband and young daughter. After the government takeover it was illegal for women to work and have their own property, money, or be out after dark. As the curtain of oppression lowered more and more each day and people began disappearing, Offred and her husband Luke and their young daughter decide to flee the country and find a safe haven in a different country. Unfortunately, they were caught and separated. 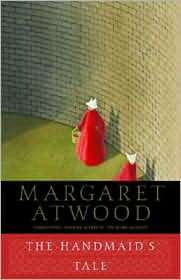 The book begins roughly three years after their failed escape attempt when Offred begins service as a Handmaid for the highest ranking Commander after the former one commits suicide. Atwood tells a story that leaves you feeling empty, paranoid, and utterly devoid of hope. The power in her writing comes from her ability to make the story transcend time. Even though it was written 20+ years ago you can picture it happening today. The empty indifference and despair coupled with hunger for companionship felt by Offred gets into your soul and it is hard to shake. I’ve left out most of the details about how she lives and her story while in service to the Commander because it is a simple story, yet so profound that I didn’t want to give away anything so that you can experience it in as pure a form as possible. After you’ve read it, I would love to hear your thoughts on the feminist angle of the book, the emotion it evoked in you, and whether or not you enjoyed the “Historical Notes” found at the end of the book. A friend is planning on setting up a book club with religion in books as its theme, and this is one she’s thinking of including. I haven’t read it in years, but remember responding to it the same way you just did. That sounds like a really cool book club theme and this book definitely fits. Do you know what other books is she wants to include?